At Al Falah we strive for the best! 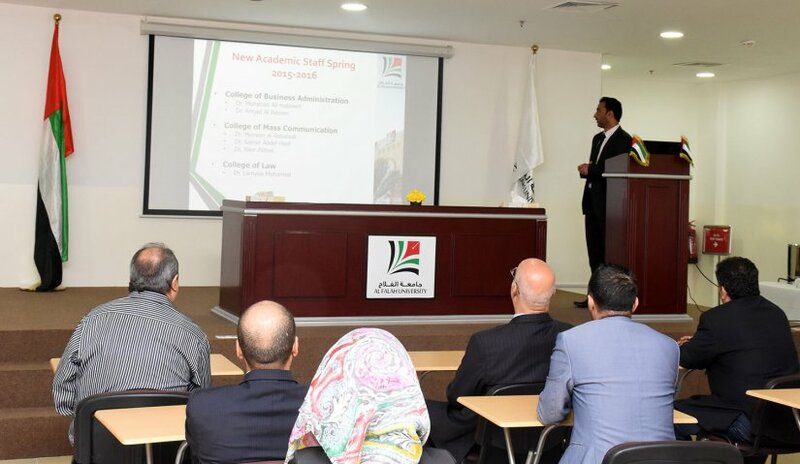 As our new academic year of Spring 2015-16 is starting from February 7, 2016, our Human Resources Department under the leadership of Mr. Ahmed Raza with collaboration of Students Affairs Department organized an “Orientation Session” for all the AFU employees. Being a fast growing family Al Falah team has welcomed highly qualified and professional faculty members in all its Colleges; College of Law, College of Mass Communication and College of Business Administration. In the presentation by Head of HR these members were formally welcomed. The presentation covered all the policies and procedures followed by Al Falah University. Our University complies with all the regulations laid down by Ministry of Labor. All the members of AFU are privileged with the facilities of company-managed visa service, financial assistance in relocation, accommodation and furnishing, flexible working hours and exceptional professional development. The Orientation Session also included brief presentations by all the Heads of the Administrative and Academic Units where they educated all the AFU members with their respective unit. These sessions are a regular feature of AFU and we aim at professional development of all our members through collegiality.